Goodbye carpet, its been fun! I love a good before and after photo. 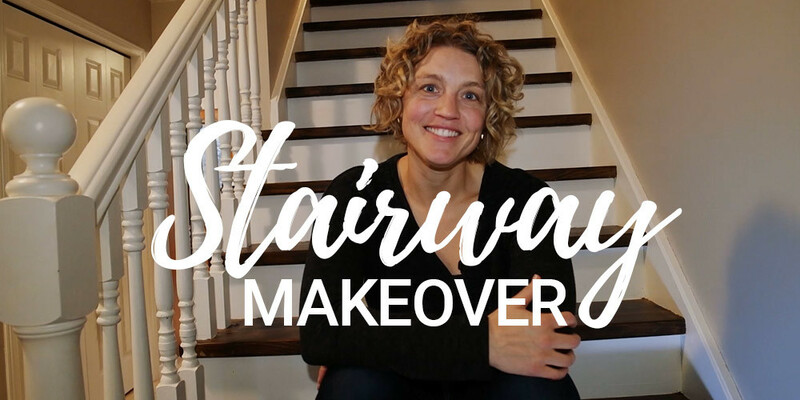 So today I’ve got a transformation video to share with you from a recent DIY project in our home. We decided to remove the 30 year old carpet from our stairs and it has completely transformed our entrance way. It’s brighter and looks so much more modern. It’s amazing what a fresh coat of white paint and some wood stain can do. It was a fairly easy project to complete over a weekend. Our kids even helped us a little. It was also a quite inexpensive project since we already had white paint and just needed to purchase the wood stain and a paint brush or two. Check out the video below to see the transformation for yourself. Do you have a home that has carpet that has seen better days? If so, I would definitely encourage you to consider a project like this. This looks great Jill. A nice clean look. Thanks for the inspiration! Might you share your Tupperware drawer with us?. I’m sure I’m not the only one with a redonkulous lid/container situation.